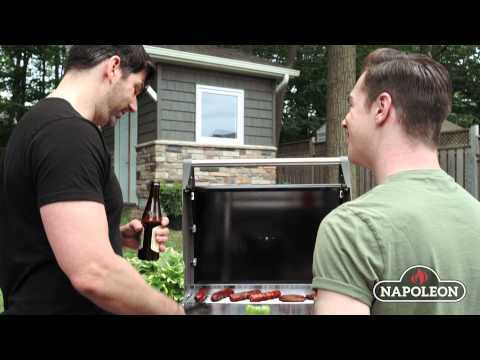 Exhibiting engineered quality at an economical price, the Triumph natural gas grill from Napoleon boasts four stainless steel tube burners, 480 square inches of cooking area, a side range burner, and up to 50,000 BTUs of grilling power. 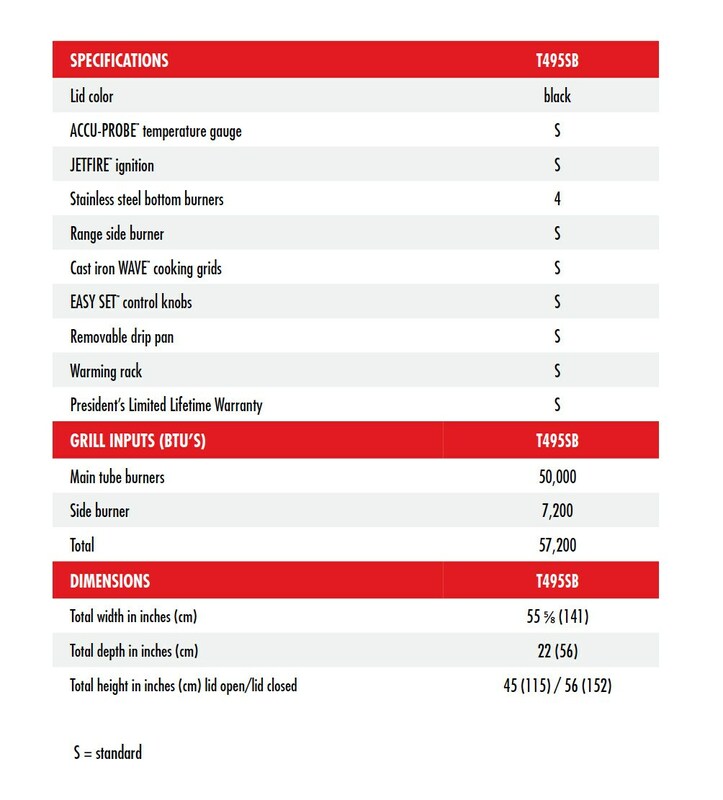 The electronic Jetfire ignition ensures a controlled flame and a quick and easy start up every time. Stainless steel, self-cleaning sear plates vaporize drippings, provides even heat distribution, and help keep your food moist. The sleek black porcelain lid retains heat for oven-like performance and features an Accu-Probe temperature gauge for measuring the precise internal temperature of your grill. Reversible cast iron wave cooking grids deliver those famous Napoleon sear lines, and the 7,200 BTU range side burner means you can prepare a complete meal from the comfort of your outdoor kitchen. The stainless steel grill cart features folding side shelves with integrated utensil holders for an added prep area, an integrated bottle opener for quenching your summer thirst, double doors for storage, and Easy Roll locking casters for moving the grill around. Cooking Grid Dimensions 27 7/8 X 16 11/16"
Napoleon offers a ten (10) Year Limited Warranty. The aluminum castings, stainless steel base, stainless steel lid, and porcelain enamel lid are warranted for ten (10) years. The painted steel lid, stainless steel tube burners, and porcelain-enameled cast iron cooking grids are warranted for five (5) years, plus half off up to ten (10) years after date of purchase. The stainless steel or porcelain sear plates are warranted for three (3) years, plus half off up to ten (10) years after date of purchase. All other parts are warranted for two (2) years. On the spec page the width being represented is with the side wings open. Do you have the width with them down? Hello and thank you for contacting us. The width of the grill with the side shelves folded down is 39 1/4 inches. Let us know if we can help you with anything else. 27 7/8 X 16 11/16" 32 1/8 X 19" 27 X 18" 29 1/2 X 17 7/8"